Rough weekend at the Coop? Did the person who barfed here feel guilty and try to either cover or clean up the mess ...? Or is the napkin from someone who wanted to use the phone? From a post-Green party, perhaps? The other day, local hyperlocal blogger EV Grieve published a post on his weblet about a young woman throwing up out the window at Motorino. There was some insinuation, innuendo and inoculation like: Where was EV Heave for all this? Well, busybody commenters, I was waiting for the results from the Barf Lab to relay the scoop. But if you must know now. I've been busy trying to reconstruct just what happened here. Using our patented RetchRecreator, we have determined that someone roughly 4 feet tall, drunk, obvs, staggered up to this rather hidden enclave on the southern corner of the Coop. First, our subject leaned his or head against the wall, muttering "what is in a Lemon Drop anyway?" before placing his or her head against the pillar. 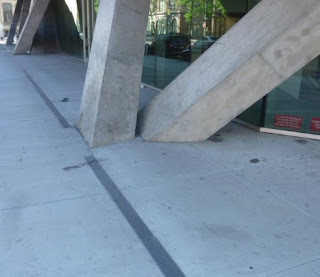 As you can see, it appears the first projectile hit the upright pillar, causing the subject to teeter, and leaving the rest of the deposit on the sidewalk. Again, the is is merely speculation. Again (again), I was waiting for the final results. You people really need to relax. A Super Bowl-caliber batch of barf. And right smack in the heart of the sidewalk. Couldn't even wait to make it to one of the building's eaves? Of course, Cooper Union Serial Vomiter WANTS you to see his or her work. Why hide it? Um, not sure what to say about this discovery outside the Coop. I can't tell if someone dropped a strawberry parfait or a jar with brain matter. It tasted more like a parfait. Of course! No wonder there have been more splats here! And just think when people actually have to watch the movie...Yuk, yuk. Yuck. Well, we're not ones to toot out own horns, though we are guilty of starting sentences with "well" too many times. Anyway, the EV Heave IT Director and our Web Evangelist recently Skyped me to tell me the fantastic news: This modest site has grown over the most recent month by an astonishing 475 percent! This, according to an analysis of our most recent analysis. Wow! Considering this site is brand new and these numbers are compared to a previous month of zereos, we're thrilled! Thank you for reading! Plus, thanks for coming to this site! Will the Serial Vomiter try to ruin the President's visit? Things have been quiet lately over here at EV Heave. Too quiet if you ask us. A chilling thought has crossed the mind of EV Heave's: What if all this has merely been a practice run for the President's visit today? After all, the President is the second most famous person to be in the East Village the last year. (Third if those Justin Bieber rumors were true.) An international stage is all the Serial Vomiter needs. Meanwhile, red-faced Cooper Union security officials were red-faced to see that the wrong kind of Barf Barriers were ordered for the Big Day. Meanwhile, the school's current barriers are, admittedly, really useless. In fact again, we freely walked around the Cooper Union last night with a Porchetta sandwich that we were eating out of a dirty ashtray and chugging buttermilk. And not one person approached us! What if we were intentionally trying to make ourselves sick? Things have been quiet at the Cooper Union. Too quiet, if you ask us or me. The Serial Vomiter has apparently gone into hiding, attempting to lull us into a false sense of complacency that can only be described as false. However, it turned out not to be a moat, but simply some road repairs. Like a blogger who chronicles the Cooper Union Vomiter the morning after St. Patrick's Day, we were embarrassingly excited to see what might be in store for us this morning near or on the Cooper Union. While making our way to our post, we, to our horror, horrifyingly saw that the city's Vomit Sweepers had just made their way up Seventh Street, passing your St. Patrick's Day HQ with surprising efficiency. Noooooooooo! we thought about yelling to no one in particular, though we aren't really ones who would actually ever yell Noooooooooo! But in all seriousness, we seriously didn't spot any vomit near or on the Cooper Union this morning. 1) It's St. Patrick's Day. Day of amateurs. And people who like to act like one. Do you really think the Serial Vomiter would bother on such a day. It's like Brett Favre showing up for training camp. No. 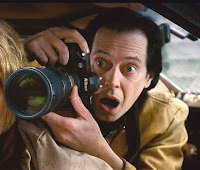 The Serial Vomiter is really sick, and lives to ruin moments that you wouldn't even begin to think about, like tomorrow. 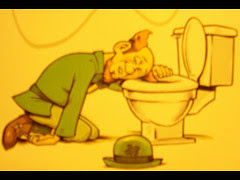 2) On St. Patrick's Day, research has shown that most people tend to throw up on themselves, not wonders of architecture like the Cooper Union. Meanwhile, stocking up for another day. Now is the time to go drink there. 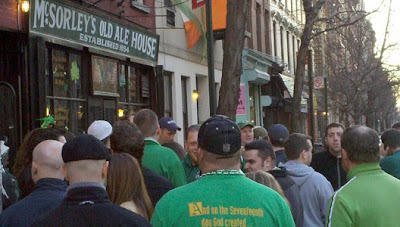 Eater sent an intern to live blog from McSorley's... The poor Coop. We did not feel like moving any closer for an inspection. A friendly tipster passed along the following from a Cooper Union student, who — wisely at first — thought the e-mail below was a hoax given all the upheaval there of late. But it is not. Cooper has been hit by a 48 hour stomach virus, characterized by projectile vomiting and high temperatures. Wash your hands frequently with soap and water. This is the single most effective preventive step you can take. Go back to using the Purell dispensers. Try not to touch your eyes, nose, or mouth. If you get the virus, stay home! Drink lots of fluids. Cooper Union officials recently probably didn't appoint a Blue Ribbon Yak Force to explore solutions to the ongoing occurrences of the Serial Vomiter targeting the school's new academic building. The solution: Barf Barriers will now surround the school. 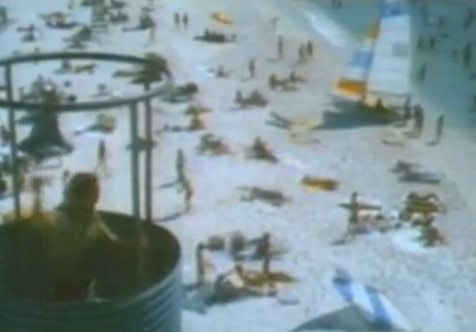 They are similar to the ones employed by Daytona Beach city officials to help combat spring breaks in the early 1980s. And they worked this last weekend: There were no reportings of vomit near or on Cooper Union.